Syria says a UN team examining former Lebanese Prime Minister Rafik Hariri's death can question two relatives of the Syrian president linked to the inquiry. Sami al-Khiyami, the ambassador to the UK, told the BBC the investigating team had not asked to interview the men before publishing its interim report. It had not put forward evidence giving grounds for questioning, he said. Meanwhile the head of the UN inquiry, Detlev Mehlis, has returned to Lebanon to continue his investigations. Mr Mehlis' interim report implicated Syrian and pro-Syria Lebanese officials and accused Damascus of misleading his investigating team. A UN resolution has threatened further action unless Syria co-operates fully. Mr Khiyami said the two men, the president's brother Maher al-Assad - who heads the presidential guard - and brother-in-law Asif Shawkat, the military intelligence chief, would co-operate with the inquiry of their own accord. "[President Bashar al-Assad] doesn't even have to make them, they will go and see the commission," he told BBC Radio 4's Today programme. He said the commission had asked to speak to, and spoken to, nine or 10 people, but never requested an interview with the two men. "In our eyes there was full co-operation. However, if the commission had said at that time that it had suspects we would have acted differently," he said. Both men were implicated in an early draft of the inquiry's report. The ambassador repeated Syrian demands for evidence that its officials had been involved in, or had known about Hariri's assassination. Syria has until 15 December to comply with the resolution sponsored by the US, France and the UK, which includes a call for Damascus to detain suspects identified by the inquiry. In response to the unanimous UN vote, Syrian Foreign Minister Farouq al-Sharaa earlier criticised Mr Mehlis for accusing his country without due process. He said no evidence had been put forward concerning alleged false and misleading statements from Syrian officials to investigators. "It is clear for any person who has followed this issue throughout that Syria's co-operation was complete. I repeat: complete." The killing of Hariri in a car bombing in Beirut in February led to widespread criticism of Syria, which was forced to withdraw its soldiers from Lebanon as a result. The UN launched its inquiry in the aftermath of the killing. Last week, Mr Mehlis said Syria had given misleading information and had not fully co-operated with his commission. At the weekend, Syria announced its own inquiry into the death of Hariri. Damascus said a special judicial committee would question both civilian and military personnel in the country. 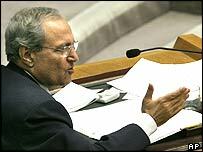 The committee would also co-operate with the UN investigation, the Syrian presidency said.